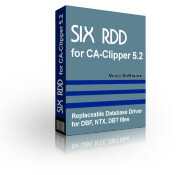 SIX RDD for CA-Clipper 5.2 is a Replaceable Database Driver (RDD) for CA-Clipper 5.2 that replaces the default NTX/DBT index and memo driver with an NSX/SMT driver that features a smaller single-file index footprint, more functionality and faster performance. Setting Apollo to run in Machine Mode is fully compatible with SIx RDD Driver 3.02. That means record locking, file locking, table updating, memo fields and indexes are properly managed between DOS-based CA-Clipper 5.2 applications using SIx and Windows applications developed using Apollo. A CA-Clipper/SIX application can lock a record in DOS and that lock will be respected by all Apollo Windows applications. Note that SIx cannot connect to the Apollo Server. The SuccessWare Index Driver (SIx Driver) is the first Replaceable Database Driver (RDD) for CA-Clipper and maintains its place in history as the leader in CA-Clipper RDD technology. The SIx Driver introduced FoxPro tables, memos, and indexes to the world of CA-Clipper 5.0 developers. Later, the new HiPer-SIx format (short for "High-Performance SIx Driver") even further improved on the "small and fast" SIx Driver tradition with its .SMT memos and .NSX index formats. SIx Driver RDD includes support for both CA-Clipper 5.2 U.S. and International Editions. The SIx Driver achieved staggering popularity that triggered Computer Associates to license a subset of the SIx Driver and include it with CA-Clipper 5.2. While the SIx Driver was never updated to work under CA-Clipper 5.3 (since many Clipper developers did not move to CA-Clipper 5.3), it remains one of the world's most popular Clipper 5.2 add-ons. The final release of the SIx Driver is 3.02 and it was released on October 25th, 1996. This 3.02 version is very mature and very stable. SIx is no longer under development, and technical support is not provided, however it is still available for purchase by those developers who require it for their ongoing CA-Clipper 5.2x legacy development. The SIx RDD Driver was designed for, and tested with CA-Clipper 5.2 only. We do not recommend using SIx with CA-Clipper 5.3, xBase++ or Harbour because it was not designed for, nor tested with these products. The SIx Driver 3.02 is fully Y2K-compliant, so you can feel secure updating your Clipper/SIx projects that your programs will operate correctly with respect to date storage and manipulation.